After you write a WordPress post, you can choose a few extra options before you publish it for the entire world to see. These settings are applied only to the post you’re working on; they don’t apply automatically to any of your future or past posts. If you don’t see the modules for the options, click the Screen Options tab at the top-right side of your Dashboard window and enable the display options. Copy a Post: Click this link to display a listing of posts you’ve already written on your blog and select one to use as a template for formatting. Request Feedback: Want to get feedback on your post before you publish it? Click the Request Feedback link and enter the e-mail addresses of the person (or people) you’d like to e-mail your draft to so that you can elicit their feedback before you publish it. Excerpt: Excerpts are short summaries of your posts. Many bloggers use snippets to show teasers of their blog posts, thereby encouraging the reader to click the Read More link to read posts in their entirety. Type your short summary in the Excerpt box. Excerpts have no word limit, but the idea is to keep them short and sweet. SendTrackbacks: If you want to send a trackback to another blog, enter that blog’s Trackback URL in the Send Trackbacks To text box. You can send trackbacks to more than one blog; just be sure to separate trackback URLs with spaces. 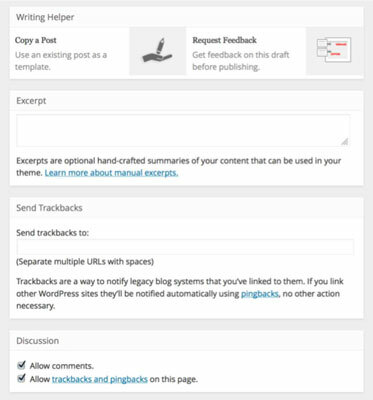 Discussion: Decide whether to allow readers to submit feedback through the comment system and whether to allow pingbacks and trackbacks by selecting the boxes here or leaving them blank. Pingbacks differ slightly from trackbacks in that the software handles them more like comments; trackbacks are generally kept separate from comments. Slug: A slug is what WordPress calls the permalink, or URL address, of an individual post or page on your blog. By default, WordPress adopts the title of your blog post to use as a portion of the URL, or slug, for your post, but you can customize it in the Slug box if you’d like. Author: For multiauthor blogs, you can use a drop-down menu to select the person listed as the official author of an individual blog post. Likes and Shares: WordPress.com allows other WordPress.com members to Like and Share posts across its global network, and your blog is no exception. However, if you don’t want your readers to Like or Share your blog posts within the network, you can disable Likes and Shares in this section by deselecting the check boxes. Publish: These are the publishing options for your blog post. Format: Some of the themes on WordPress.com support Post Formats, which are different types of posts such as video posts, photo galleries, and asides (small, short status updates), that have special formatting and styling. If you are using a theme with Post Formats, you see a module on the right side of the Add New Post page titled Format, where you can select the format. Categories: You can file your posts in different categories to organize them by subject. Select the box to the left of the category name you want to use. Don’t see the category you need listed here? Click the Add New Category link at the bottom of the Categories box to add a new category. Tags: Tags are a nice feature of WordPress.com because they allow you to add searchable and archived keywords for your posts in small subtopics. Type your chosen tags (or keywords) in the Tags box. Tags can be single words or several words; just make sure to separate tags with commas (for example, enter books, movies, pop culture, entertainment). Featured Image: When uploading images to your blog posts, you can select one image to serve as a Featured Image for your post, and it displays as a thumbnail on your blog in areas such as archive listings and search results. Use the Featured Image module to assign the title to an image, if you are using one (or more). When you finish setting the options for your post, don’t navigate away from this page because your options haven’t been fully saved. You need to scroll back up to the top and click the Save Draft button on the top-right side of the page.